Comprising a necklace, of ninety-eight cultured pearls measuring approximately 6.70 to 7.00 mm, joined to a pearl clasp--29 in. ; a necklace, of eighty cultured pearls measuring approximately 6.50 to 6.80 mm, joined to a pearl clasp, mounted in white gold--23 in. ; a necklace, of eighty-eight cultured pearls measuring approximately 6.60 to 7.00 mm, joined to a pearl clasp--26 in. 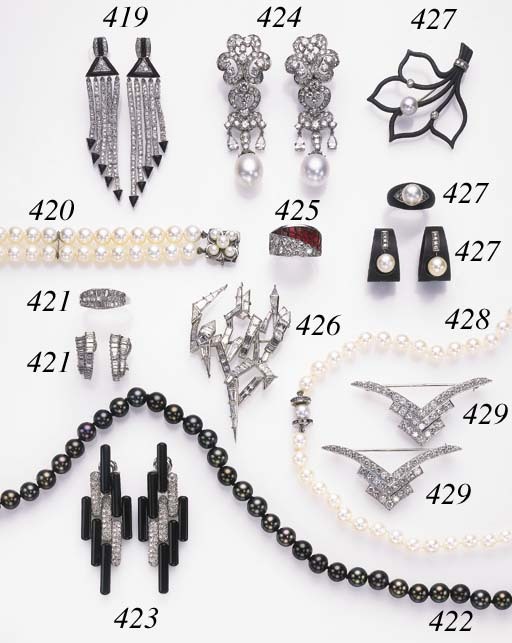 ; a pair of cultured pearl studs, each measuring approximately 7.80 mm, joined to a white gold back; a pair of earrings, each of linear design with four cultured pearls, forming an arch, flanked by circular-cut diamonds, mounted in white gold; and a bracelet, composed of a double row of twenty-four cultured pearls each, spaced by white metal terminals, joined to a white gold and pearl clasp--8 in.